The Nisca PR5360LE single-sided ID card printer (item#: PR5360LE) is a powerful and affordable solution to print high-quality cards and badges on the spot. The Nisca PR5360LE ID card printer comes with the unparalleled capability to print 24-bit images for superior card quality. You will get stunning badges at the outstanding speed of 164 cards per hour! The printer is feature-packed to simplify the printing and maintenance processes: automatic cleaning, quick-change ribbon cassettes, and a two-line LCD display for easy printer operation. For maximum security, add UV security to your cards by printing data only visible with UV light. The printer driver is password-protected to control access to printing functionalities. The PR5360LE card printer features a 2- year warranty on printer and printhead, and a 100,000 card Mean Time Between Failure (MTBF). Encoding: modules for magnetic, HID Prox, iClass, MIFARE, Legic, DesFire, and Contact IC encoding are available. Lamination: the PR5302 lamination unit can easily be added to the Nisca PR5360LE card printer to add an extra layer of protection to your cards. Laminating your cards will significantly reduce the risk of counterfeiting and tampering, while extending the lifespan of your cards. 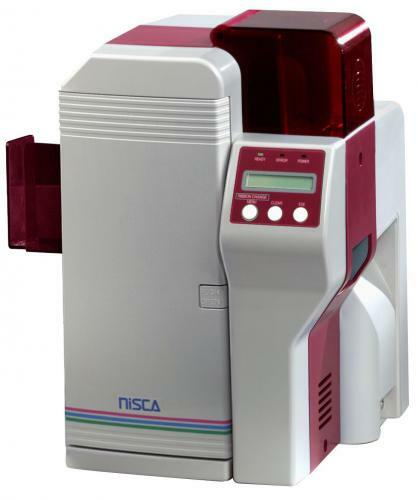 The Nisca PR5360LE Single Sided ID Card Printer features a 2-year warranty and 1-year loaner.